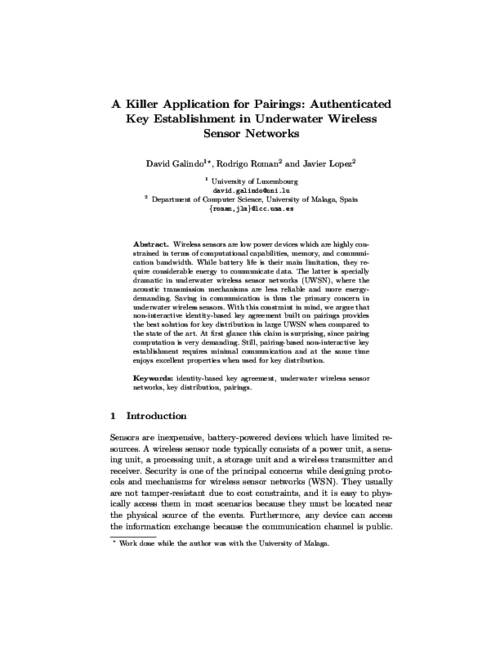 A Killer Application for Pairings: Authenticated Key Establishment in Underwater Wireless Sensor Networks | Network, Information and Computer Security Lab. Wireless sensors are low power devices which are highly constrained in terms of computational capabilities, memory, and communication bandwidth. While battery life is their main limitation, they require considerable energy to communicate data. The latter is specially dramatic in underwater wireless sensor networks (UWSN), where the acoustic transmission mechanisms are less reliable and more energy-demanding. Saving in communication is thus the primary concern in underwater wireless sensors. With this constraint in mind, we argue that non-interactive identity-based key agreement built on pairings provides the best solution for key distribution in large UWSN when compared to the state of the art. At first glance this claim is surprising, since pairing computation is very demanding. Still, pairing-based non-interactive key establishment requires minimal communication and at the same time enjoys excellent properties when used for key distribution.